Summary : Energetic Commercial Sales Representative III with 18 plus years of experience in Retail Sales Domain, who helps to create a dynamic work atmosphere and is committed to cooperation among co-workers, administrators and patients/customers/clients while maximizing efficiency through innovative ideas that address the diverse interests and needs of an office setting. Responsible for selling material to contractors and taking care of their needs. Answering an average of 50-100 calls per day by addressing customer inquiries, solving problems. Greeting the customers entering the store to ascertain what each customer wanted or needed. Describing the product to customers and accurately explaining the details and care of merchandise. Communicating with the vendors regarding back order availability, future inventory and special orders. Providing an elevated customer experience to generate a loyal clientèle. Recommending, selecting and helping to locate and obtaining out-of-stock product based on customer requests. Answering product questions with up-to-date knowledge of sales and store promotions. Effectively communicating with and supported sales, marketing, and administrative teams on a daily basis. Developing reputation as an efficient service provider with high levels of accuracy. 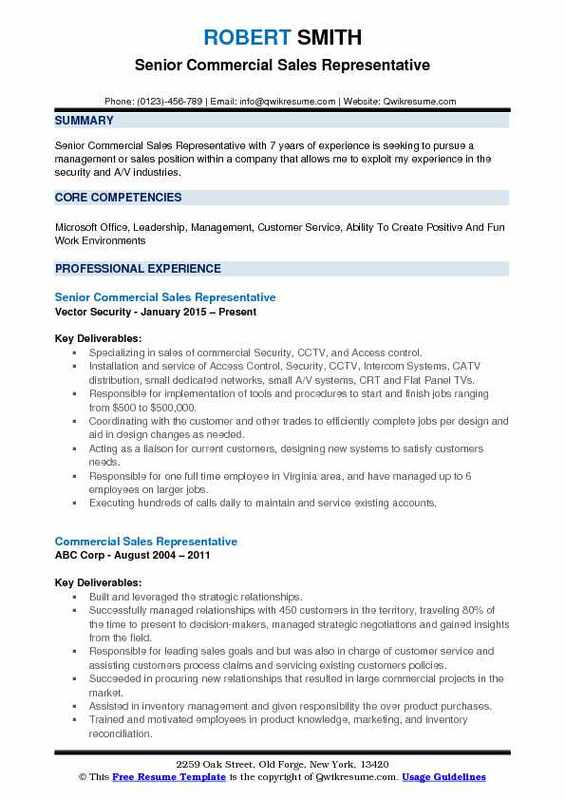 Summary : Senior Commercial Sales Representative with 7 years of experience is seeking to pursue a management or sales position within a company that allows me to exploit my experience in the security and A/V industries. Specializing in sales of commercial Security, CCTV, and Access control. Installation and service of Access Control, Security, CCTV, Intercom Systems, CATV distribution, small dedicated networks, small A/V systems, CRT and Flat Panel TVs. Responsible for implementation of tools and procedures to start and finish jobs ranging from $500 to $500,000. Coordinating with the customer and other trades to efficiently complete jobs per design and aid in design changes as needed. Acting as a liaison for current customers, designing new systems to satisfy customers needs. Responsible for one full time employee in Virginia area, and have managed up to 6 employees on larger jobs. Executing hundreds of calls daily to maintain and service existing accounts. Making presentations to commercial businesses for burglary and fire systems, access control and CCTV. Summary : Self-motivated Commercial Sales Representative IV experienced in both technical and non-technical, fast-paced team environments. Proven ability to develop and implement sales and marketing programs and acquire new business across a variety of territories, customers and industries. Managed the sales process for multifamily building owners, property managers and general contractors for window and storefront projects from $50k to $1m+. Performed takeoffs and assembled estimates for large commercial projects utilizing field. Observations and measurements, review of architectural, interior design and structural drawings and detailed review of project manuals and specifications. Selected the correct products based on customer needs, project specifications and applicable regulations. Consulted with architects, engineers, designers, and owners to develop scopes of work to satisfy project intention. Prepared comprehensive and technically detailed bid proposals, submittals, and shop drawings. Prospected and conducted face-to-face sales calls with executives, design professionals, and directors throughout assigned territory. 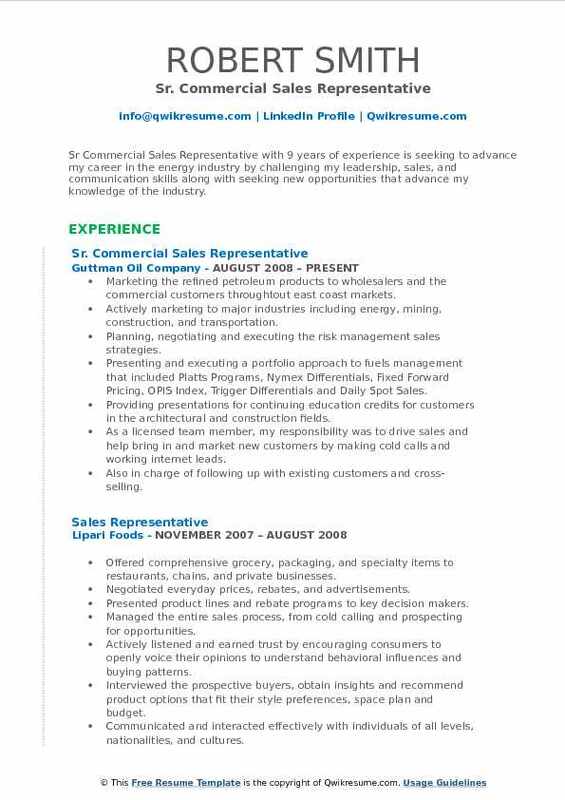 Summary : Sr Commercial Sales Representative with 9 years of experience is seeking to advance my career in the energy industry by challenging my leadership, sales, and communication skills along with seeking new opportunities that advance my knowledge of the industry. Marketing the refined petroleum products to wholesalers and the commercial customers throughtout east coast markets. Actively marketing to major industries including energy, mining, construction, and transportation. Planning, negotiating and executing the risk management sales strategies. Presenting and executing a portfolio approach to fuels management that included Platts Programs, Nymex Differentials, Fixed Forward Pricing, OPIS Index, Trigger Differentials and Daily Spot Sales. Providing presentations for continuing education credits for customers in the architectural and construction fields. As a licensed team member, my responsibility was to drive sales and help bring in and market new customers by making cold calls and working internet leads. Also in charge of following up with existing customers and cross-selling. Developing solutions for potential customers, conduct building surveys to create sales proposals, drawing building maps for device locations, creating contracts, negotiating terms, and closing. 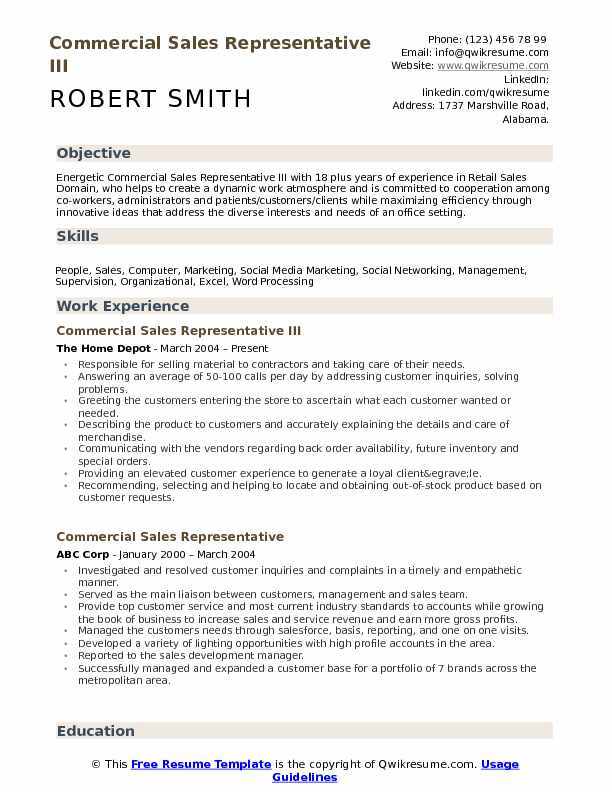 Objective : Commercial Sales Representative with 2 plus years of experience is seeking to obtain a position that will provide a constant challenge to my education and experience and become a valued asset in achieving organizational goals. Highly dedicated professional with a track record for organizational loyalty in meeting operational and sales objectives. Increasing the commercial, enterprise residential sales substantially through creative sales techniques. Resolving the commercial and enterprise, problems and ensuring satisfaction in person. 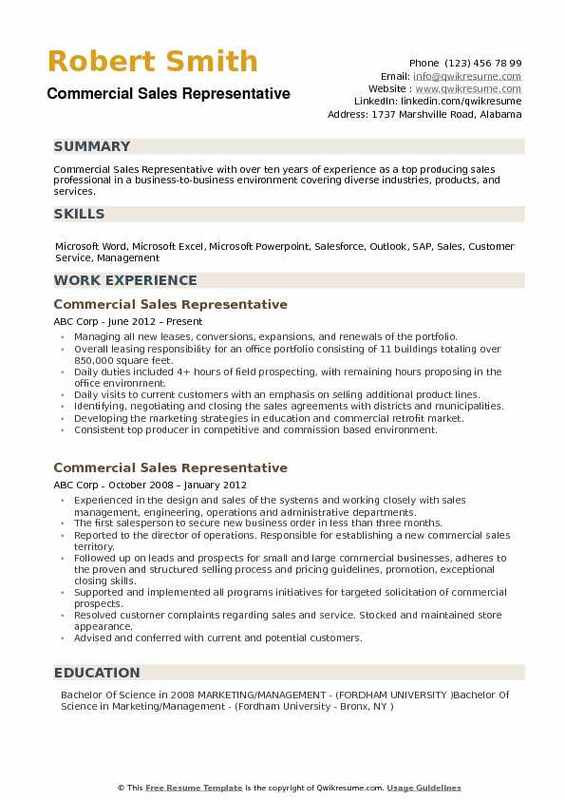 Skilled in attaining sales and profit objectives in competitive environments. Expanded the commercial sales position into a full-time, profitable operation. Establishing close client relationships, evaluating the regional trends and product strategies, promoting new products, and maintaining client service and satisfaction. Developing new accounts within given territory by self-generated, and company provided prospects. Building strong relationships with existing accounts to develop additional business, seeking referrals, and creating additional revenue sources by offering new products and services. Building rapport with clients/customers and the community to promote long-term business growth. 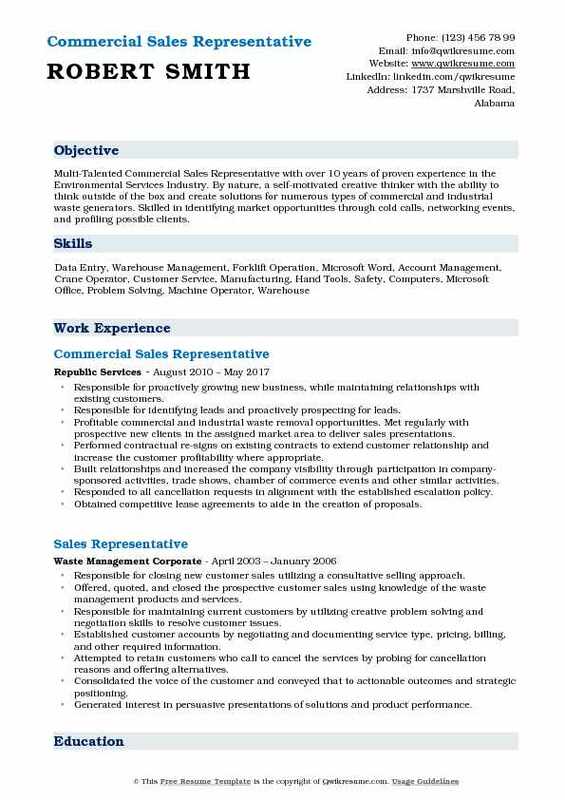 Summary : Multi-Talented Commercial Sales Representative with over 10 years of proven experience in the Environmental Services Industry. By nature, a self-motivated creative thinker with the ability to think outside of the box and create solutions for numerous types of commercial and industrial waste generators. Skilled in identifying market opportunities through cold calls, networking events, and profiling possible clients. Responsible for proactively growing new business, while maintaining relationships with existing customers. Responsible for identifying leads and proactively prospecting for leads. Profitable commercial and industrial waste removal opportunities. Met regularly with prospective new clients in the assigned market area to deliver sales presentations. Performed contractual re-signs on existing contracts to extend customer relationship and increase the customer profitability where appropriate. Built relationships and increased the company visibility through participation in company-sponsored activities, trade shows, chamber of commerce events and other similar activities. Responded to all cancellation requests in alignment with the established escalation policy. Obtained competitive lease agreements to aide in the creation of proposals. Focused on building customer loyalty and developing the brand. 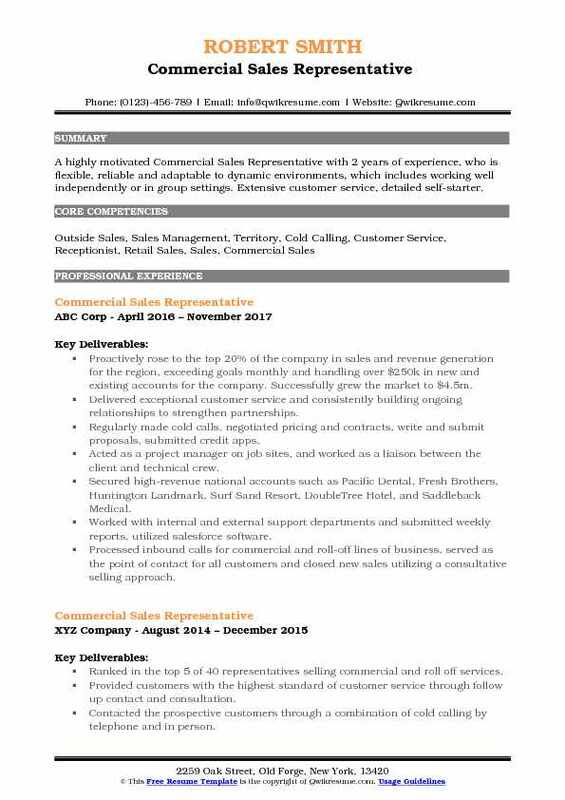 Summary : Experienced, results-driven Commercial Sales Representative II with 16 plus years of experience in the Retail domain. Consistent above-quota sales performance and exceeding recurring monthly revenue goals Customer needs identification, product demonstration, and contract negotiation. Multiple project coordination to optimize performance and expedite on-time completion Development/implementation of revised policies and procedures. Skills : Territory Management, New Business Development, Project Management, Account Management, Marketing/Communications, Excellent Oral Presentation. 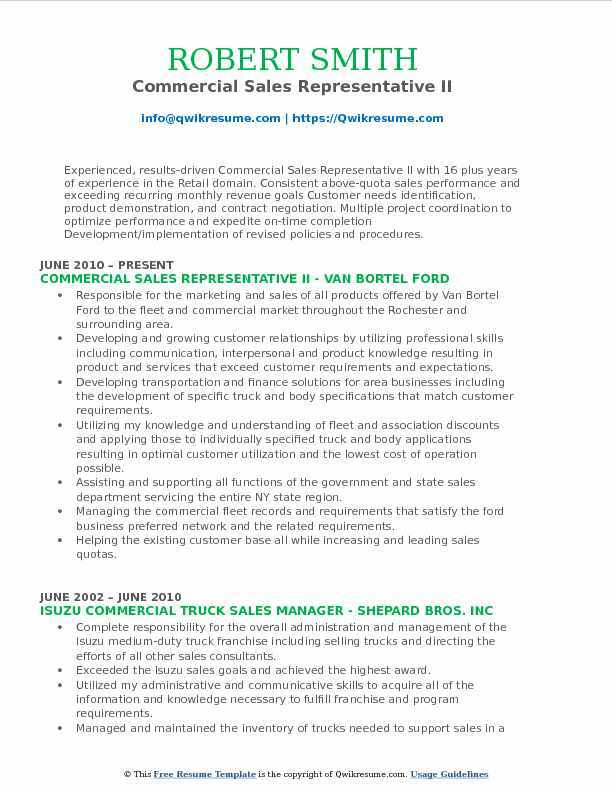 Responsible for the marketing and sales of all products offered by Van Bortel Ford to the fleet and commercial market throughout the Rochester and surrounding area. Developing and growing customer relationships by utilizing professional skills including communication, interpersonal and product knowledge resulting in product and services that exceed customer requirements and expectations. Developing transportation and finance solutions for area businesses including the development of specific truck and body specifications that match customer requirements. Utilizing my knowledge and understanding of fleet and association discounts and applying those to individually specified truck and body applications resulting in optimal customer utilization and the lowest cost of operation possible. Assisting and supporting all functions of the government and state sales department servicing the entire NY state region. Managing the commercial fleet records and requirements that satisfy the ford business preferred network and the related requirements. Helping the existing customer base all while increasing and leading sales quotas. 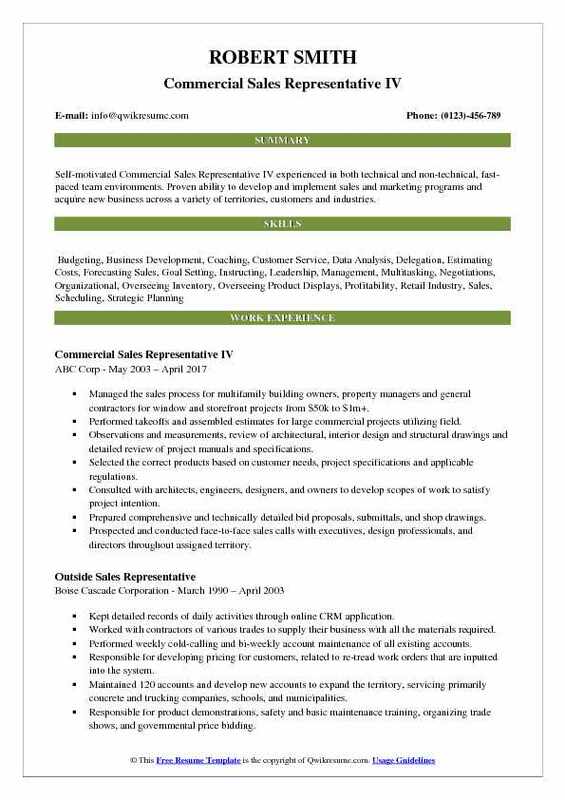 Objective : A highly motivated Commercial Sales Representative with 2 years of experience, who is flexible, reliable and adaptable to dynamic environments, which includes working well independently or in group settings. Extensive customer service, detailed self-starter. Proactively rose to the top 20% of the company in sales and revenue generation for the region, exceeding goals monthly and handling over $250k in new and existing accounts for the company. Successfully grew the market to $4.5m. Delivered exceptional customer service and consistently building ongoing relationships to strengthen partnerships. Acted as a project manager on job sites, and worked as a liaison between the client and technical crew. Secured high-revenue national accounts such as Pacific Dental, Fresh Brothers, Huntington Landmark, Surf Sand Resort, DoubleTree Hotel, and Saddleback Medical. Worked with internal and external support departments and submitted weekly reports, utilized salesforce software. Processed inbound calls for commercial and roll-off lines of business, served as the point of contact for all customers and closed new sales utilizing a consultative selling approach. Increased market share and revenue generation by identifying and qualifying sales opportunities, as well as up-selling additional products and services. 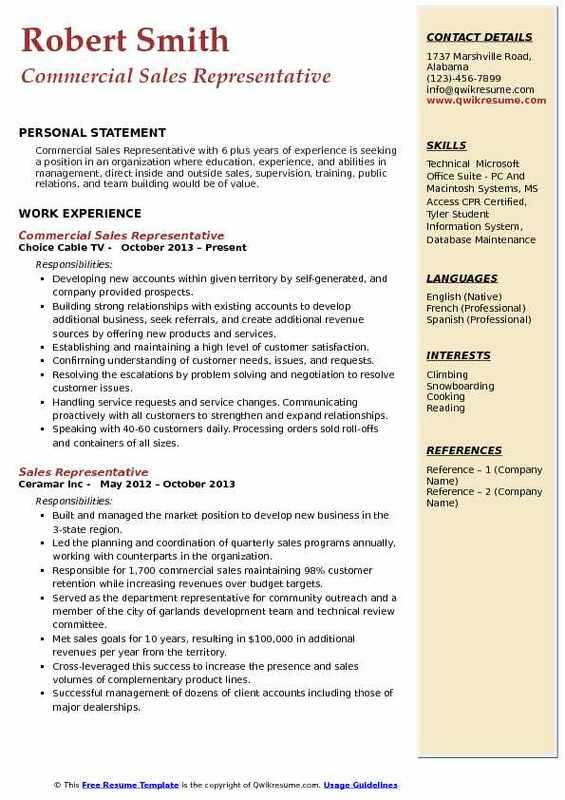 Headline : Commercial Sales Representative with 6 plus years of experience is seeking a position in an organization where education, experience, and abilities in management, direct inside and outside sales, supervision, training, public relations, and team building would be of value. Building strong relationships with existing accounts to develop additional business, seek referrals, and create additional revenue sources by offering new products and services. Establishing and maintaining a high level of customer satisfaction. Confirming understanding of customer needs, issues, and requests. Resolving the escalations by problem solving and negotiation to resolve customer issues. Handling service requests and service changes. Communicating proactively with all customers to strengthen and expand relationships. Speaking with 40-60 customers daily. Processing orders sold roll-offs and containers of all sizes. Developing new business through the use of cold calling, phone and email campaigns. 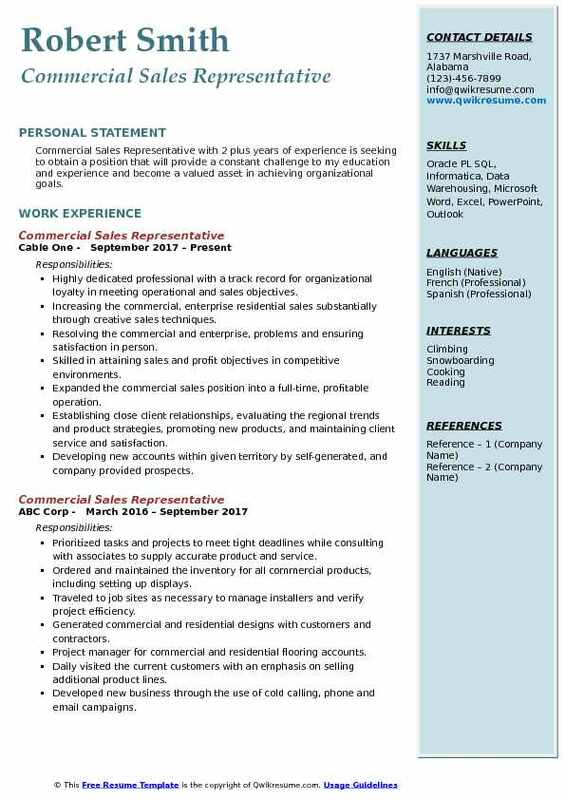 Summary : Commercial Sales Representative with over ten years of experience as a top producing sales professional in a business-to-business environment covering diverse industries, products, and services. Managing all new leases, conversions, expansions, and renewals of the portfolio. Overall leasing responsibility for an office portfolio consisting of 11 buildings totaling over 850,000 square feet. Daily duties included 4+ hours of field prospecting, with remaining hours proposing in the office environment. Daily visits to current customers with an emphasis on selling additional product lines. Identifying, negotiating and closing the sales agreements with districts and municipalities. Developing the marketing strategies in education and commercial retrofit market. Consistent top producer in competitive and commission based environment.